Dizziness is a common complaint for many people, especially for women going through menopause. One of the most common complaints doctors receive from their patients is about dizziness. It is a good idea to talk to your doctor if your dizziness persists or if you also have other symptoms. However, there are some lifestyle changes and home remedies that may be able to reduce your dizzy spells. Stress and anxiety can cause dizziness, so reduces stress is a good idea. Dizziness can also be caused by dehydration, so using tea to stay hydrated may also be beneficial. Different types of tea can calm and relax different people. 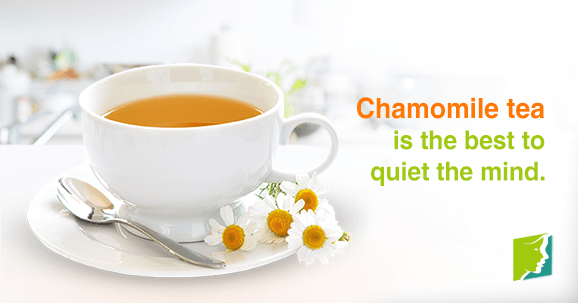 However, many people prefer tea flavored with mint, lemon, and chamomile when they want to relax and de-stress. Try to stay away from black tea and other types of caffeinated tea because caffeine can cause dehydration. Though small amounts of salt are necessary for a healthy diet, too much salt can cause dehydration and high blood pressure, which can lead to dizziness. When in the body salt absorbs water, which leaves less water for cells to perform their necessary functions and keep your body in proper order. Dehydration can also aggravate other symptoms of menopause as well. You can cut back on your salt intake by adding less of it to the food you make for yourself. Always try food before you add salt to it. 75% of the salt the average person consumes has already been added to their food. This means that cutting back on high-sodium foods like salad dressings, cured meats, chips, and processed snacks can also help. Alcohol and caffeine can also cause dizziness. Many people have probably experienced the most well-known form of dizziness associated with alcohol. This is usually referred to as “the spins” and is the result of drinking too much alcohol. However, drinking moderate amounts of alcohol can lead to some types of dizziness, and this is also true with caffeine. If you feel like you are sensitive to alcohol or caffeine you should try to cut back on your consumption in order to help relieve your dizziness. Dizziness caused by menopause is a result of hormonal changes. As estrogen levels decrease, body chemistry sometimes causes blood vessels to constrict, leading to dizzy spells. Herbs like black cohosh and gingko contain phytoestrogens, which are plant components that act like estrogen in the human body. Other supplements that are believed to interact with hormones also exist. By using these home remedies for dizziness you may be able to prevent some dizzy spells. However, it is important that if your dizziness persists that you see a doctor. Dizziness can have many different causes, so it is important you see a doctor who can diagnose your problem correctly and help you find the right treatment.